By Saturday evening, most presidential hopefuls had offered their condolences. "With one or two exceptions we expect all presidential hopefuls to attend the funeral mass," added the same source, indicating that all state bodies, political parties and groups, including the Muslim Brotherhood, had already contacted the church. "Many have been asking how they might pay their respects and participate in the funeral mass." Meanwhile, official and church sources said a high level of state representation is scheduled for the funeral mass. The head of the ruling Supreme Council of the Armed Forces (SCAF) Mohamed Hussein Tantawi is expected to appear at the Cathedral to offer his condolences, whilst SCAF's number two, Sami Annan, is expected to be present throughout the mass. Tantawi has announced three days of official holiday to Coptic Christians. Annan and several other member of the SCAF were invited to attend Christmas Mass on 6 January despite the outrage of the Coptic public at the military’s involvement in the killing of Coptic demonstrators on 9 October last year while they protested a series of attacks on Coptic churches across Egypt. Diplomats and foreign dignitaries are also expected at the funeral, which will probably take place at the Abbassiya Cathedral, before the coffin is taken to a monastery in Wadi Al-Natroun for burial. 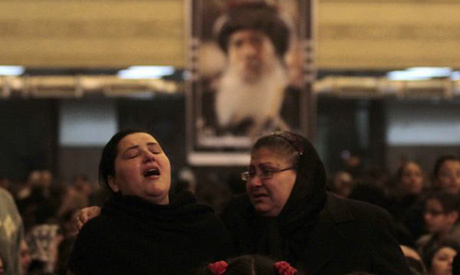 Most presidential hopefuls, as well as the SCAF, MPs and political activists have issued statements mourning the loss of Pope Shenouda III.